Easter is a fantastic time. Spring has arrived, flowers start to blossom and the favoured chocolate covered eggs are beginning to hit the shelves. However, with the introduction of the sugar filled children’s treat comes, on average, 3000 tons of Easter Egg packaging which is discarded from the 8 million Easter Eggs sold in the UK every year. According to the Which? study, Easter Egg packaging, on average, accounted for 25% of the overall product weight. Which? produced a list of the top 10 eggs with the most packaging and top of the list was ‘Thornton’s Classic Large Egg’. The overall weight of the Easter Egg is 418g, the weight of the chocolate; 254g. This implies that the packaging weighs 152g, which is over 36% of the overall weight. That being said, it’s not all doom and gloom. 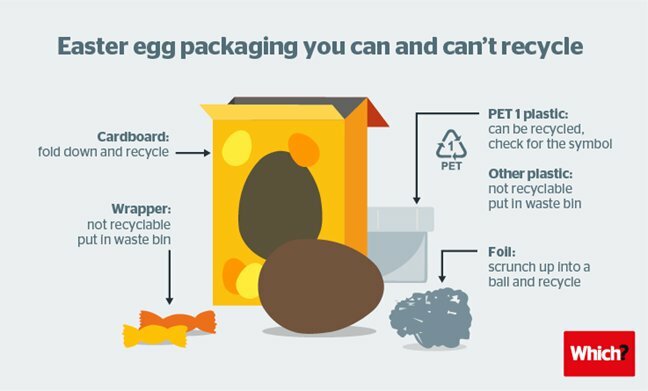 Over the past few years there has been much needed changes in the industry and now almost all of the Easter Egg packaging can be recycled. The only parts of the Easter Egg packaging which can’t be currently recycled are the plastic window and the chocolate bar wrappers. Most of the plastic in the packaging is constructed from PET 1 (Polyethylene Terephthalate) which is usually used to package water, soft drinks, cosmetics or household cleaners. This type of plastic is easily recycled and 99% of local authorities offer the service. The tin foil can also be recycled, but not the chocolate bar wrappers. If you ever find yourself with the question of what can or can’t be recycled then Recycle Now offer a comprehensive list. By providing this technical support, recycling facilities similar to Impact Recycling will be able to sell on trusted recycled material, with higher quantities and purities being returned to product and increasing the value of these plastics.